I snapped these on Thanksgiving evening. 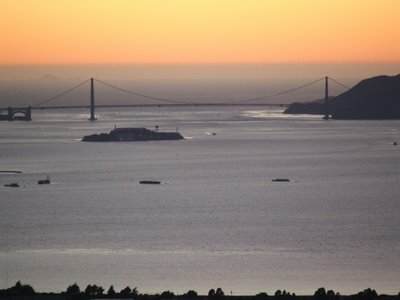 They are taken from the Berkeley hills looking west across the bay toward San Francisco. In the picture above San Francisco is a little right of center…you can bareley see the silhouettes of the buildings. The Golden Gate bridge is against the far right of the photo. Note crescent moon. Yes, it’s expensive to live here…but, sometimes you get what you pay for.